Blog Home > Entertaining > Burger Party, Anyone? A fun, easy way to feed big crowds this summer is with a burger bar. You might be thinking of the usual suspects: an aluminum foil tray of grilled burgers and a plastic bag full of buns sitting next to a pile of lettuce and tomato. What’s so special about that? 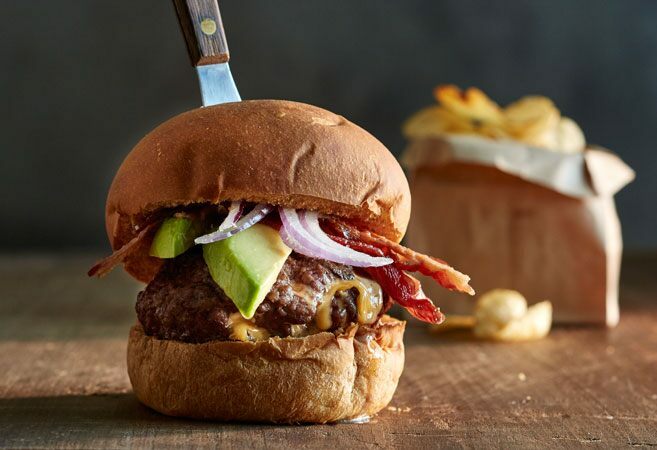 With a few small tweaks, you can make your guests feel like gourmet burger chefs when you deck out your DIY burger bar with a beautiful array of unique toppings and specialty condiments. Dress everything up with a little creative décor and—ta-da—an unforgettable burger party! 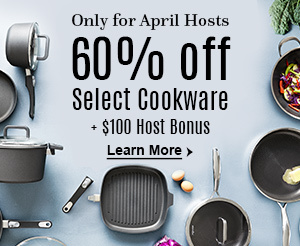 A Pampered Chef consultant can also share lots of great recipes and burger party ideas. Here’s how to bring it all together. 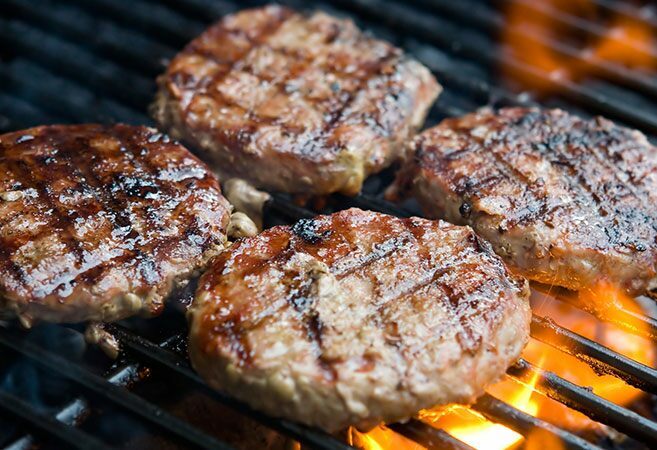 Looking to improve your burger grilling skills? Read How to Throw a Backyard Bash. It’s got lots of helpful tips to avoid outdoor party problems and how to make amazing burgers. New to grilling? Get started with A Pampered Guide to Grilling for some basics. The toppings you put out will set your burger bar apart from the standard cookout fare. Go beyond the lettuce and tomatoes. Think arugula or barbecue sauce! Don’t just put out the plain mayo. Mix in equal parts sour cream and season it with your favorite seasoning mix to make unique mayo-based sauces. Here’s a list of burger bar toppings to get you started. Use as much or as little of this list as you like. Get crazy and try something truly creative! Or, check out The Ultimate List of Burger and Hot Dog Toppings for more exciting ideas. The best part of letting guests build their own burgers is that everyone gets to make something they will love to sink their teeth into. How you dress up your table will also set your burger bar apart, even with the most basic toppings. Use Baskets: Buns look best removed from their plastic bags and arranged in a wide, shallow basket that’s lined with fabric. You can drape some of the fabric over the buns to keep them covered. Smaller baskets hold napkins and silverware nicely. 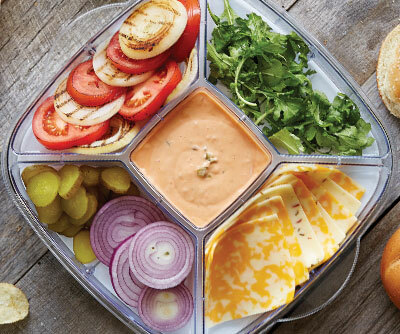 White Platters & Trays: Arrange toppings onto large white platters and plates. Keep the tomatoes (or any toppings that’re a little juicy) on a plate by themselves. 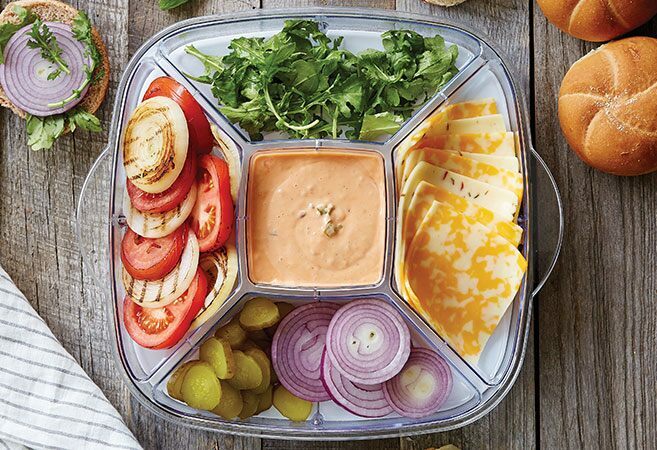 Pro Tip: The 5-Section Tray for the Large Square Cool & Serve tray keeps a variety of burger toppings organizes, separated, cooled, and beautifully displayed. Condiments Contained: Don’t just set out the big bottle of ketchup and mustard. Use a muffin pan to hold a variety of burger sauces, mustards, and ketchup. It’s very affordable and makes your picnic table chic. You can label each dipping sauce with chalkboard tags (so you can reuse them at your next party). Ready to party? A consultant can share awesome tools to make that topping prep and outdoor cooking faster and easier. Contact your consultant (or find one) today! One Response to Burger Party, Anyone?